Our Bi-Annual BAG SALE has been rescheduled for is Saturday, March 9th opening at 11:00 AM. Fill a 13-gallon bag with clothing, shoes & accessories for just $10 per bag. 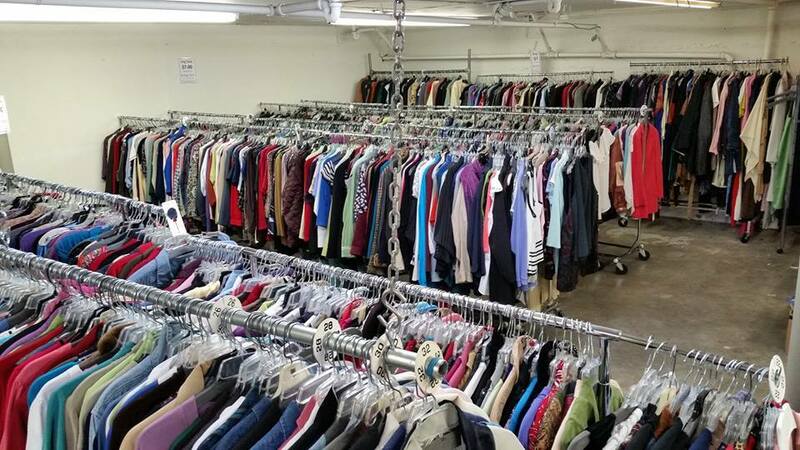 If you haven't been to a bag sale before, here are some tips to help you navigate the sale. Got any that we missed? Share in the comments! Entrance to the bag sale is through the parking lot and is held downstairs in our basement. You will need to be able to walk down a flight of concrete steps. Come early to find the best selection! People do start lining up as early as 8-9:00 am. We will hand out numbers when you arrive, so you can leave and come back closer to opening time. You can only receive a number if you are present, you cannot receive additional numbers for friends. We will also be stopping the line going in when the basement is full and then allow more to go down as others leave. In the past you needed to be in line by 10AM to get into the first group down. We provide the bags. Before we open, we'll pass out bags and write your name on them. You can guess how many bags you may want, but you are not committing to buying that many and you can always get more if necessary. There is a 4 bag maximum per person until 2:00 pm. Bring Cash! The fastest way to pay downstairs is to pay with cash. If you need to pay with a card you will leave your bags in the basement & go to the main floor to pay at the register (sometimes a long wait). We prefer if you can pay for the bags and take them to your car if you have one. We can help carry bags to cars if you need assistance. Otherwise you can leave them in the basement and come back to pick up after shopping and/or paying in the store. We do NOT have room in the main store to hold your bags. Items are organized by size in 3 categories: tops, bottoms and long items. In addition, there are bins of shoes by size and other accessories. There are no dressing rooms and not a lot of room to try items on. But for $10 a bag, you can always pass along items that don't work out. Be patient, kind with one another, and have fun! We love to see our community helping each other out while finding great deals. Proceeds from the Bag Sale benefit Seattle Women's Assistance Fund which provides free women's clothing to homeless and low-income residents of the Seattle area. RSVP on our Facebook Event Page or follow us on Instagram to see updates & previews! Hi Janice! Once you arrive in the line you will receive a number. You can then go to your car or a coffee shop, etc to wait until about 10:40 for our 11am open. Or some people bring chairs to sit on too!